Canadian Permanent Residents – Beware the New eTA! If you think the new eTA rules won't affect you...think again! If you come from a visa exempt country, need to travel abroad in the near future, and your Canadian PR Card is expiring soon, you are in deep trouble. However, you are in luck…this Podcast can help. 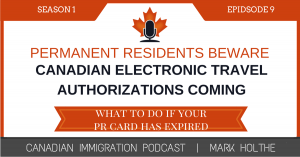 In this episode of the Canadian Immigration Podcast, I provide some great insight on how Canadian permanent resident’s from visa exempt countries will be negatively affected by the Canadian Electronic Travel Authorization (eTA) process that will become law on March 15, 2016. As a Canadian permanent resident, you may think it does not affect you. However, if you come from a visa exempt country and are accustomed to simply travelling on your passport as you always have when your PR Card expires, you are facing a very unpleasant reality – you will no longer be able to do so! If you are planning to travel in the next 6 months and your PR Card will expire in this time, the airlines will not allow you to board without a valid PR Card, or an eTA. As a PR of Canada, you can’t get an eTA. In this episode, I’m going to give you some strategies to deal with this potentially disastrous situation. Why I have not released a Podcast in 2 months – and how I have figured out a way to ensure this doesn’t happen again. Job Opportunities within Holthe Tilleman LLP – If you are an immigration lawyer or certified immigration consultant looking for a more flexible and balanced professional opportunity, I share the opportunity that exists with our team. Canadian Immigration DIY Guide Dilemma – Should I or shouldn’t I actually create these? What is New with Citizenship and Immigration Canada – Name changes and the ugly Electronic Travel Authorization (eTA) world. Answers to Listener Questions– What to do when you need to travel before your PR Card is ready. How to deal with an uncooperative immigration representative. -indicated that Billie and I would use or prior experience as Canadian immigration officers to debate whether or not a spousal sponsorship application should be approved based upon a fictitious fact pattern we developed. -Billie and I will be doing this in Episode 10 instead of this episode, so stay tuned, because it should be a lot of fun. Decided to create a Course on Express Entry where I could teach a large group of people at the same time how to prepare and submit their EE applications. -produced webinars on express entry to provide free information and introduce people to the concept of an EE course. -created and ran my first pilot program on how to submit an Express Entry profile. -however, the interest in the course was not sufficient to justify going through with it. -surprising result was that many more people would rather hire our firm directly than take the course. -this was unexpected and resulted in considerably more work for the firm than I anticipated. -my time had to be focused on helping all the new clients and I did not have time to continue with the Podcast and producing new content for the Canadian Immigration Podcast website. -because IRCC has made the process so complicated and difficult, many dabbling lawyers and light weight consultants have now dropped out of the picture because they could not keep up with the changes and were not able to competently help people with immigration. -because I love podcasting so much and producing content for my site, I knew I would have to make some changes within our law firm. -I have now made adjustments by hiring new staff and restructuring my firm so that I can once again turn my attention to what I love to do most, which is creating the Canadian Immigration Podcast and providing free resources and information to people that can not typically afford to hire an immigration lawyer. -I also want to extend an invitation to any currently practicing Canadian immigration lawyers or certified immigration consultants, no matter where you live in Canada or abroad, who are looking for an opportunity to work within an awesome growing law firm, but do not want the stress of having to meet certain targets, or work on a full time basis. -Because of the virtual nature of our law firm, we are in a position to offer a platform in which you can work as much or as little as you want under the Holthe Tilleman LLP umbrella in whatever geographic location you may be in. You would be able to work on a contract basis or in a part-time capacity while being compensated directly for the work you want to do. -This is how I intend to continue meeting the needs of our clients and create opportunities for professionals who have seen their practices shrink with the toughening immigration market and the significant restrictions on TFWs and people no longer qualifying for PR. -Just reach out to me directly through our firm website at ht-llp.com or contact me through my LinkedIn profile, Facebook, or any other method that works. You can also call our law firm directly on our toll free number at 1-844-485-8204 and ask to speak with me. –So I have decided to not continue forward with the course. -Dilemma I now face is whether or not it makes sense for me to create DIY guides for those who simply want to do it themselves, but would like a little professional help to avoid some of the common pitfalls that easily beset people who try to do it themselves. -So I want to hear from you. -If you think it would be a good idea for me to create a series of DIY Guides to Canadian Immigration I would love to get your feedback. -These guides would be video tutorials on how to complete the various types of Canadian immigration applications. -You can respond in the comment section of this Podcast, or send us your thoughts via our Canadian Immigration Podcast Facebook Page. I’d love to hear from you. -The responses we receive will largely dictate whether or not I proceed forward with the DIY Guides at this time. So please take the time to let me know if you think it would be something useful for people who could not otherwise afford to hire an immigration representative. -transition is slowly taking over and now we are seeing virtually all communication coming back as IRCC versus CIC. -CIC website has not yet changed. I considered registering the domain name for IRCC as soon as the change was announced, but I’m not really in the business of being a domain squatter. Exceptions include U.S. citizens and travellers with a valid visa. Entry requirements for other methods of travel (land, sea) have not changed. – What if your PR Card is expiring and you need to travel. -what if you need to travel and need your PR Card extension processed on an Urgent Basis? returning to Canada on a commercial vehicle, like an airplane, train, boat or bus. Even if these conditions apply to you, we may not be able to process your request urgently or get your card to you before you need to travel. – Can you imagine the nightmare that is going to happen for visa exempt nationals such as UK, Australian, or other Canadian PR holders who come from visa exempt countries and have to travel without a valid PR card? – in the past, they could often just travel on their Passports and airlines or CBSA would rarely have an issue when they returned because they didn’t need a visa. -however, now if they are PRs, the airlines will not let them board unless they have a valid PR card, or hold an eTA. -well, PRs of Canada can not apply for an eTA, so what are these people to do? -if you are a PR abroad and you have lost your PR Card, or you have applied to extend it and it has not yet been processed and you want to return to Canada, IRCC requires that you apply for a Travel Document as a Canadian consulate or visa office abroad. -what a colossal waste of time and drain on everyone’s resources. -let me share with you what I am advising my clients. -remember, eTAs only apply to “air travel”. So if you are entering Canada via a land crossing from the US, then the old rules apply. -although there is never a guarantee that a CBSA officer will not give you some hassle, I am advising my visa exempt clients who have PR Card extensions in process and need to travel after their current PR cards have expired to travel to the US by land and then fly domestically within the US or internationally from a US airport and then return to Canada via the land crossing. -obviously, visa exempt nationals with PR status in Canada must still meet the requirements of the US visa waiver program, or hold a valid US visa; however, in this manner, business trips, important personal trips can still be accommodated for without the hassle of applying for a Travel Document. If you have any specific questions regarding this process, just leave me a comment and if it is something that all our listeners could benefit from, I will share it with everyone. Current processing times to receive your initial PR Card are at 42 days. Just to give you a background I had applied under the Express Entry program last year through a consultant. However as the consultants were really ineffective I decided to opt out of their services. Now I am trying to apply on my own this year and had a question regarding the application process. While applying I am asked if I had applied to CIC before and there is another question asking if I had applied for EE before. I belive I should say yes, as my ex-immigration consultants had applied on my behalf right? They are yet to share the Express Entry file number and the Unique Client Identifier (UCI). In your opinion they should be sharing these identification numbers with me right? As when I was with them, they never shared these details. Answer: Absolutely. Any representative, whether immigration consultant or lawyer has an obligation to cooperate with you when you wish to discontinue their representation. If you owe them money, they may be able to keep the work product that they created and not return it to you. However, when it comes material that you have paid for, you are entitled to receive copies of your file materials which includes your EE file number and UCI number. If a lawyer, then you can search the Provincial Law Society governing body where the lawyer practices and follow the links providing instructions on how to report misconduct. If you have a question or topic you would like covered in our next podcast, please let me know by leaving me a voice message by clicking on the “Ask an immigration Question” widget on the right side bar of the Canadian Immigration Podcast website. You can also leave me a message by going to the “Contact” section of the CIP website and leaving a message on Facebook, Twitter, or LinkedIn. You can also fill in the comment section provided on the contact page. In the coming episodes, I am going to be interviewing various Canadian immigration industry leaders who will be sharing their experience and insight into some of the current challenges people are facing with Express Entry as well as other issues we as immigration lawyers and consultants face when representing our clients before Immigration, Refugees and Citizenship Canada. Don’t forget to subscribe to the CIP on iTunes and take the time to rate the Canadian Immigration Podcast. The more responses we get, the more exposure the Podcast will receive by those who can benefit from what we share and the tips and guidance we provide in navigating the complex world of Canadian Immigration. I answer questions each week on my podcast. If you have a question, comment, thought or concern, you can do so by clicking here. We’d love to hear from you. You can also leave me a voice message on the Ask an Immigration Question widget on the side bar of this website.